Looking to add a dash of Gatsby-esque glamour to your dinner parties? Then look no further than Coupe Stack, a clever new invention designed by Barnaby Macaulay inspired by a family heirloom given to his great-grandfather by the Maharaja of West Bengal – a set of eight glasses that rest on the flat base of each glass below. Realising there was nothing similar on the market, Barnaby got to work sketching and the Coupe Stack was created. Each of its six glasses boasts a ledge inside it to ensure safe stacking. 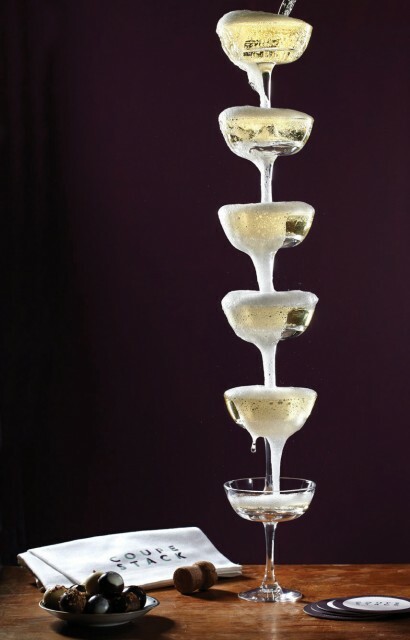 When Champagne, Prosecco or your fizz of choice is poured into the top glass, it flows down from glass to glass creating a sparking wine waterfall, with a 75cl bottle of bubbles filling six glasses. Though given the current trend for magnums and Methuselahs in the UK, the high pour can be prolonged.